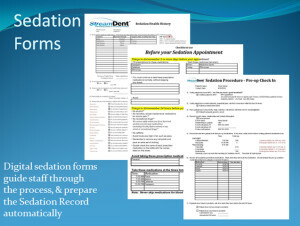 StreamDent®’s digital Anesthesia Record streamlines your workflow for sedation dentistry. Paperless forms guide your team through the entire sedation process, and prepare your Anesthesia Record automatically. Start off with the Sedation Health History that guides your staff member with the exact questions to ask to verify your patient will remain safe throughout their procedure. Key questions help your team member perform a pre-assessment of the patient’s health history so that much of the preparation process can be delegated. Fully customizable pre-op instruction pages spell out exactly what steps your patient needs do to in order to follow your sedation protocols. The check-in procedure on the day of the sedation appointment goes smoothly with the Pre-Op Check In form. Calculate time codes for complex sedation procedures quickly and easily using the algorithms in the StreamDent® Time Code Builder©. This easy to use spreadsheet allows your business assistant to schedule the appointment with the proper amount of time allowed for pre-op procedures, clinical processes, expanded functions and post-op time. During the sedation appointment, the StreamDent® Anesthesia Record© guides you through a timeout before the start of your procedure. As records are entered during the sedation procedure, graphs display vital signs and drugs you’ve administered automatically. The software even makes a time-based calculation of your local anesthetic doses so you can avoid exceeding maximum safe levels. At the end of the procedure, use the Error Check section to make certain no critical information has been omitted. And after everything is complete, the StreamDent® Anesthesia Record© even writes your sedation clinical notes for you! The StreamDent® Anesthesia Record© and the StreamDent® Time Code Builder© are Excel-based spreadsheets. Microsoft Excel is required to use the software.